November 23, 2002  The recent fuel oil spill off the coast of Spain is likely to cost tens of millions of dollars to clean up. But the environmental damage is just beginning to be understood -- especially since the tanker Prestige sank with 17 million gallons of fuel oil on board. NPR's Christopher Joyce reports. November 20, 2002  A damaged tanker sinks off the coast of Spain, spilling tons of oil into the ocean. Salvage crews work to contain the spill; officials fear an environmental disaster worse than the 1989 Exxon Valdez spill off Alaska. NPR's Christopher Joyce reports. November 20, 2002  Rare good news about orangutans: Scientists have found a previously unknown population of the great ape, living in the dense rainforest of Borneo. The discovery is a boost to orangutan conservation. NPR's Christopher Joyce reports for Radio Expeditions. November 9, 2002  Recent research shows black carbon in soot may contribute to global warming by absorbing sunlight. Diesel engines are one source of soot. But wood fires in less developed countries -- including China -- are also a problem. NPR's Christopher Joyce reports. November 8, 2002  Two papers in the journal Nature shed new light on the relationship between wildfires and the environment. Major fires in Indonesia in the late 1990s spewed large amounts of carbon into the atmosphere, contributing to global warming. NPR's Christopher Joyce reports. October 31, 2002  As the El Nino weather phenomenon returns, scientists, farmers and business people brace for its possible effects. But meteorologists say El Nino will be mild this year. NPR's Christopher Joyce reports. 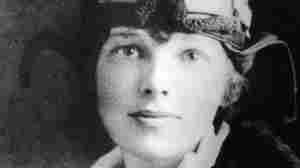 December 2, 1998  Researchers have found the strongest evidence yet that aviator Amelia Earhart and her navigator Fred Noonan crashed-landed in the South Pacific in 1937 and died waiting for rescue.